What's the Best Way to Dispose of Electronics? Home > Ask Our Experts > What's the Best Way to Dispose of Electronics? What is the best way to despose of electronics, e.g. televisions? The succinct answer to this question is simple – recycling is the best way to dispose of electronics. Consider that many electronic items contain metals, plastics and batteries – for instance circuit boards alone contain polybrominated flame retardants, selenium and cadmium, which are all hazardous chemicals. So through improper disposal, incineration or going into landfill, electronic materials can release harmful, hazardous chemicals into the environment. 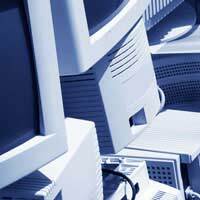 The fairly recent Waste Electrical and Electronic Equipment (WEEE) Directive has been running for around two years, the main aim being to cut the amount of electrical and electronic equipment sent to landfill or incinerated. As a result, you may find that recycling facilities are more abundant than they were around five years ago. Your first port of call should be to call your local council or council-run recycling centre (tidy tip). If they don’t have the facilities in place to deal with electronics, they may be able to advise you of locally run businesses that can dispose of or recycle your electronic waste for you. Many tidy tips will have safe disposal or recycling points for batteries, CDs, computers, and large and small electrical appliances. There are some furniture aid companies that will be only too happy to take larger electronic ‘white goods’, such as computers or televisions. Commonly these companies help previously homeless or vulnerable individuals and families to set up a new home. They rely on donations from the general public, so although your television may be old and too small for you, it could still have years of use for someone else. Smaller electronics such as mobile phones and palm computers and computer components are cited as a problem, as they are upgraded and disposed of more frequently than larger electronics. Electronics such as circuit boards can be sent to specialist recycling organisations, which dismantle them and reuse the copper, silver and gold. This helps to reduce the amount of raw materials used in manufacturing. You may have to trawl the net for a commercial recycling organisation in your region, as they are not as widespread or as accessible as council-run recycling centres. Many voluntary or business to community organisations will take on your old computers. If in working order, your old ‘outdated’ computer can be sent on to community charity groups, schools or even out to third world countries. Reputable companies will advise you how to make sure that all your personal data from old hard drives is removed and protected. There are many UK CD recycling businesses – try the Applegate directory or simply use your search engine to locate the appropriate recycling company for your needs. Likewise, mobile phones are also easily recycled. In some third world or eastern European countries, landline infrastructures are poor, so mobile phones are a much better alternative. ActionAid and Oxfam are two well-known and widespread organisations that will take your old mobile phones off your hands. Charities such as Victim Support Southwark reconfigure mobile phones to become emergency lines for people vulnerable to violent crime. It’s all a case of knowing who will take what electronic devices from you. With legislation in place, manufacturers are continually being pushed to make recycling of their devices much easier, so in time this dilemma should be much more simple to resolve. However, as already mentioned, the best course of action is to contact your local council to see if there is anyone in the area affiliated or known by them to help you properly and safely dispose or recycle your electronic equipment. How Will Tyre Recycling Business Affect Locals? How to Recycle Our Office Telephones? What Do the Numbers on Plastic Bottles Mean? Ideas for Recycling Wine Bottle Corks? Hi everyone, I learned that recycling mostly has to do with glasses, cans, food waste, electronics, etc. But what about cosmetic products? I used to be a compulsive shopper esp. make-up. Then I realized I don't apply them daily (rather about 3 or 5 times a year), after they get expired it's not safe or healthy to use them. I can't just simply throw them away. Is it possible to recycle them? Or is there any solution for this? I'd really appreciate it. I remember as a child melting expanded polystyrene with plastic glue and wondered if a domestic / small unit had been developed that allows us to dissolve the expanded polystyrene, rather than allowing it to break apart and scatter across the fields and onto our water supplied and the sea. The dissolved material would have to be collected to be recycled / reclaimed into the plastics industry. I realise that the fluid would most likely be toxic, however the upside would outweigh the thousands of years and ongoing biological, food chain and toxic pollution associated with these products.